The Andean Condor, Vultur gryphus, is a species of bird in one of the vulture families.It is in many regards the largest flying land bird in the Western Hemisphere and is the heaviest, but not the lengthiest, member of the order Ciconiiformes. 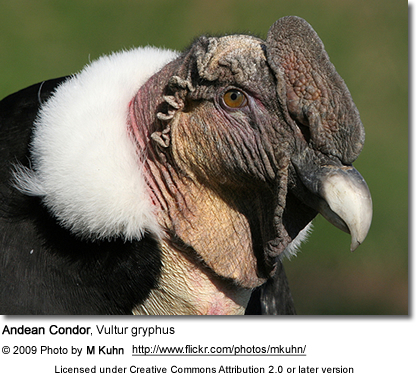 This condor inhabits the Andes mountains. Although it is primarily a scavenger, this species belongs to the New World vulture family Cathartidae, related to storks and not closely related to Old World vultures, which are in the family Accipitridae along with hawks, eagles and kites. 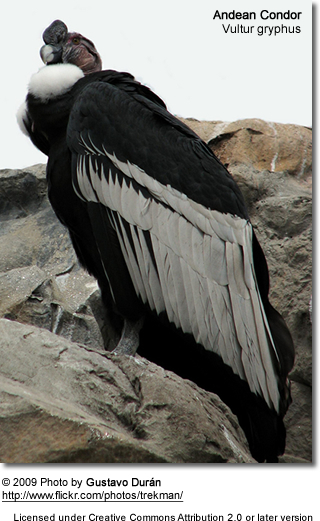 Although about 5 cm shorter (beak to tail) on average than the California Condor, the Andean Condor is undoubtedly larger in wingspan: Ferguson-Lees gives 274–310 cm (108–122 in). It is also heavier: up to 11–15 kg (24–33 lb) for males and 7.5–11 kg (16–24 lb) for females. Measurements are usually taken from specimens reared in captivity. The adult plumage is of a uniform black, with the exception of a frill of white feathers nearly surrounding the base of the neck and, especially in the male, large patches or bands of white on the wings which do not appear until the completion of the first moulting. As an adaptation for hygiene, the head and neck have few feathers, exposing the skin to the sterilizing effects of dehydration and ultraviolet light at high altitudes, and are meticulously kept clean by the bird. The head is much flattened above. In the male it is crowned with a caruncle or comb, while the skin of the neck in the male lies in folds, forming a wattle. The skin of the head and neck is capable of flushing noticeably in response to emotional state, which serves to communicate between individuals. The middle toe is greatly elongated, and the hinder one but slightly developed, while the talons of all the toes are comparatively straight and blunt. The feet are thus more adapted to walking as in their relatives the storks, and of little use as weapons or organs of prehension as in birds of prey and Old World vultures. The female, contrary to the usual rule among birds of prey, is smaller than the male. 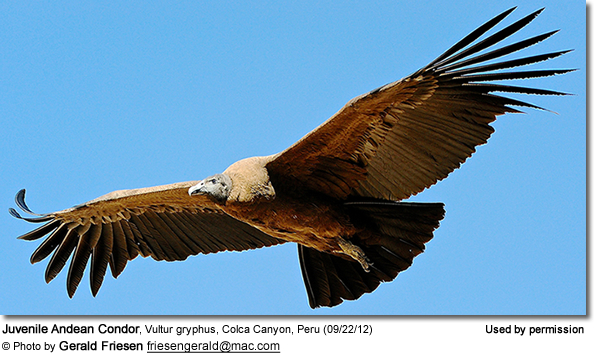 Sexual maturity and breeding behavior do not appear in the condor until 5 or 6 years of age. They may live for 50 years or more, and mate for life. 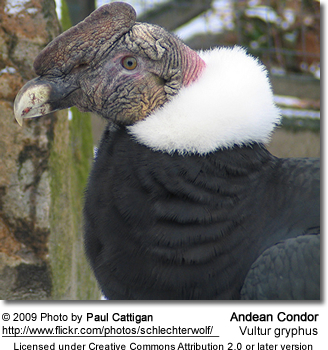 The Andean condor prefers roosting and breeding at elevations of 3,000 to 5,000 m (10,000–16,000 ft). There on inaccessible ledges of rock, its nest consisting merely of a few sticks placed around the eggs, it deposits one or two bluish-white eggs, weighing about 10 ounces (280 g) and from 3 to 4 inches (75 to 100 mm) in length, during the months of February and March every second year. The egg hatches after 54–58 days of incubation by both parents. If the chick or egg is lost or removed, another egg is laid to take its place. Researchers and breeders take advantage of this behavior to double the reproductive rate by taking the first egg away for hand-rearing, causing the parents to lay a second egg which they are generally allowed to raise. The young are covered with a grayish down until almost as large as their parents. They are able to fly after six months, but continue to roost and hunt with their parents until age two, when they are displaced by a new clutch. There is a well developed social structure within large groups of condors, with competition to determine a 'pecking order' by body language, competitive play behavior, and a wide variety of vocalizations, even though the condor has no voice box. On wing the movements of the condor, as it wheels in majestic circles, are remarkably graceful. The lack of a large sternum to anchor correspondingly large flight muscles identifies them physiologically as primarily soarers. The birds flap their wings on rising from the ground, but after attaining a moderate elevation they seem to sail on the air. Charles Darwin commented on having watched them for half an hour without once observing a flap of their wings. They prefer to roost on high places from where they can launch without major wing-flapping effort. Oftentimes, these birds are seen soaring near rock cliffs, using the heat thermals to aid them with rising in the air. Wild condors inhabit large territories, often traveling 250 km (150 miles) a day in search of dead animals. 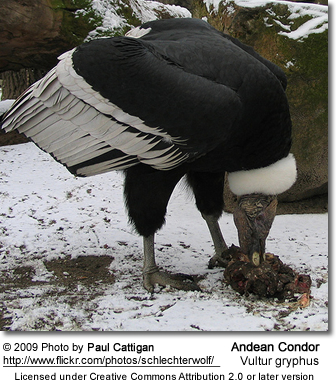 They prefer large carcasses such as deer or cattle which they spot by looking for other scavengers, who cannot rip through the tougher hides of these larger animals with the efficiency of the larger condor. In the wild they are intermittent eaters, often going for a few days without eating, then gorging themselves on several pounds at once, sometimes to the point of being unable to lift off the ground. The Andean Condor is the national symbol of Bolivia, Colombia, Ecuador, Peru, Argentina, and Chile. It plays an important role in the folklore and mythology of the South American Andean regions, similar to the role the Bald Eagle plays in North America. As such, condors are depicted in the national coats of arms of Colombia, Ecuador, Bolivia, and Chile, and can also be seen in the state flag of Ecuador. One of best known Peruvian songs is El Cóndor Pasa (The condor passes), composed by Peruvian musician Daniel Alomía Robles. The melody attained world fame years later, in Paul Simon's "If I Could". Tourists can see the condors flying freely at the Colca Canyon in Peru, which is a natural habitat of the great Andean Condor. The Andean Condor is becoming more common in bird shows, and these large birds can prove very powerful and aggressive, so a well-trained Andean Condor appearing free in a public show is an impressive feat. 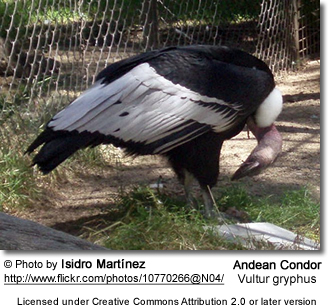 The Andean Condor is the only accepted species of its genus, living or extinct. Unlike the California Condor, which is known from extensive fossil remains and some additional ones of congeners, the fossil record of the Andean Condor recovered to date is scant. Some prehistoric genera of New World vultures seem to be closely related to Vultur; the Argentine Early to Middle Pliocene Dryornis pampeanus may actually belong into this genus. Presumed Plio-/Pleistocene species of South American condors were later recognized to be not different from the present species, although one known only from a few rather small bones found in a Pliocene deposit of Tarija Department, Bolivia, may have been a smaller palaeosubspecies, V. gryphus patruus (Fisher, 1944).